My friend and former co-host Kristian Petersen recently suggested that we store all of our old interviews at Archive.org. Indeed, this makes good sense. So as I continue to re-post old interviews to this blog as well as to my "Podcasts" page here, I will be adding them to our Archive.org page called MRB Radio Archive. Both Kristian and Dave Krueger have said that they will be including their interviews there also. 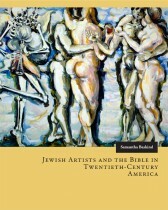 This one is with Samantha Baskind, author of Jewish Artists and the Bible in Twentieth-Century America. I will admit that prior to reading this book, I had never heard the names Jack Levine, George Segal, Audrey Flack, Larry Rivers, and R. B. Kitaj. But Baskind introduces each of these artists to readers, bringing us to the intersection of their biblical art and Jewish heritage. As Baskind demonstrates and the reviews have confirmed, such a focus on religion makes this book unique within the world of modern art history. Often these themes are overlooked or discarded. But Baskind puts the Judaism of these artists at the center of her narrative, emphasizing that any understanding them would be otherwise incomplete. Moreover, she does this with remarkable clarity so that even someone like myself who has a limited understanding of this field can follow along and profit from this story.